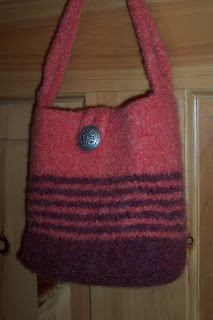 This bag was something I had to knit covertly, as I was in the Favorite Things 3 Swap on Ravelry, so I had taken to just calling it "Secret" on Ravelry. My pal has posted that she received her parcel, so now I can blog and Ravel it ... but I didn't take notes, and can't remember what I did to make the bag, so I guess it will be a unique , one of a kind, designer bag! LOL! It is made of Patons Country Wool Merino in Salmon Heather and Cognac Heather colourways, with a heavy, vintage button. 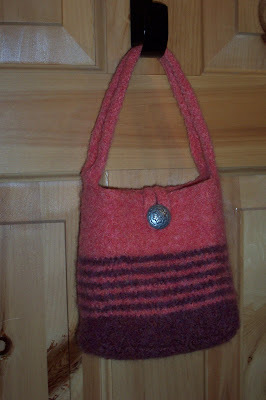 The bag is only wee ... just barely big enough for a cell phone, keys and a small wallet. Super cute! I need to join one of these swaps! It is lovely! You are quite the designer! I alway forget to take notes too. It's a problem when you come up with brilliant. :-D I'm the lucky recipient of this cute little purse and let me tell you, I LOVE it! 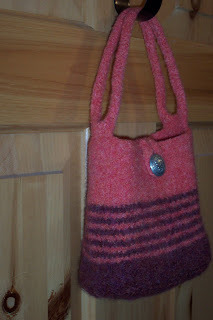 I feel so sassy when I carry my new little bag - it's just so adorable! Great job on the purse and my whole wonderful swap package.